A late show earned Cardiff City passage through to the fifth round as goals in stoppage time from Ross McCormack and Chris Burke beat Leicester City. 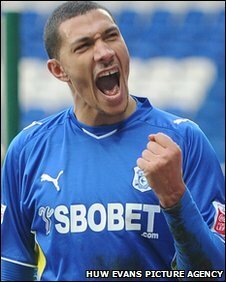 Jay Bothroyd's diving header from Michael Chopra's right-wing cross gave Cardiff an early lead before Michael Morrison's header equalised. Dany N'Guessan gave Leicester a half-time lead before Peter Whittingham's 18th goal this term from a free-kick. But Burke and McCormack stuck late on to knock-out play-off rivals Leicester. 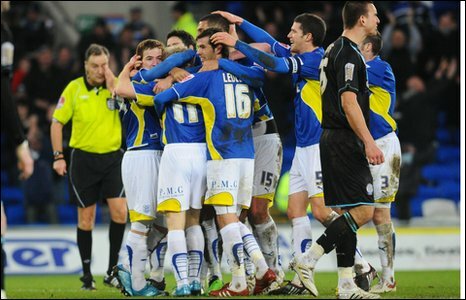 Cardiff are in the draw for fifth round for just the second time in 16 years. The Bluebirds' previous appearance was in 2008 when Dave Jones' men encapsulated the romance of the famous competition when Cardiff went all the way to the Wembley final. And Scottish international McCormack's first of the season three-and-a-half minute into time added on sealed the dramatic victory at the Cardiff City Stadium. The tie between the two Championship play-off hopefuls seemed to be heading for a replay with the game locked at 2-2 before super sub Burke sparked the celebrations at the the end in the first minute of stoppage time. Bothroyd had put the hosts in front in the 17th minute with his eighth of the season when he headed strike-partner Michael Chopra's pin-point right-wing cross into the net from six yards. But Nigel Pearson's men responded positively and were level just after the half-hour mark as Paul Gallagher's free-kick picked out Morrison and the defender slotted home with a neat right-footed finish. Leicester were in front five minutes later when Waghorn found N'Guessan who scored from close-range to score his third goal against a Welsh club this season. The visitors missed chances as midfielder Matt Oakley dragged a shot wide from the edge of the area and Yann Kermorgant flashed a left-footed effort wide. Cardiff striker Chopra then went close forced Leicester keeper Chris Weale to palm away his right-footed strike. But Whittingham's 17th goal of the season drew Cardiff level 19 minutes from time as the winger swung in a free-kick from the right which evaded everybody and found the far corner of the net. Cardiff keeper David Marshall saved well to keep out Kermorgant's close-range header. But with time running out Burke made no mistake with a right-footed finish to claim his sixth goal of the season from 12 yards out to nudge the hosts in front. And McCormack sealed victory and extended their unbeaten run to six games when he slotted home from close range after being set up by Bothroyd. "We have been seriously hit with a virus but have had to dig deep for two victories. "At 2-1 down I couldn't see where we could get any movement to be back in the game but we had the breaks and we took them." "I think we deserved better than that but you have to take your chances. "By half-time we were well on top but you cannot concede goals like that. Our set-plays were good, their keeper made some great saves and we were denied a clear penalty but to lose 4-2 is poor from our point of view. "We cannot feel sorry for ourselves and must get back to winning ways in the league as the result today is not a true reflection of how the game went." 90:00+5:20 The referee signals the end of the game. 90:00+4:36 Free kick awarded for a foul by Jack Hobbs on Jay Bothroyd. Mark Kennedy takes the free kick. 90:00+3:27 Assist on the goal came from Jay Bothroyd. 90:00+3:27 GOAL - Ross McCormack:Cardiff 4 - 2 Leicester Ross McCormack finds the back of the net with a goal from inside the six-yard box to the bottom right corner of the goal. Cardiff 4-2 Leicester. 90:00+1:26 GOAL - Chris Burke:Cardiff 3 - 2 Leicester Chris Burke finds the net with a goal from deep inside the penalty box low into the middle of the goal. Cardiff 3-2 Leicester. 90:00+0:07 Inswinging corner taken left-footed by Peter Whittingham from the right by-line, Jay Bothroyd challenges Chris Weale unfairly and gives away a free kick. Indirect free kick taken by Chris Weale. 89:55 Chris Burke takes a shot. Blocked by Matt Oakley. 85:34 Matt Fryatt takes a shot. Save made by David Marshall. 84:33 Free kick awarded for a foul by Ross McCormack on Paul Gallagher. Direct free kick taken by Wayne Brown. 81:36 Substitution Matt Fryatt comes on in place of Martyn Waghorn. 79:32 Outswinging corner taken right-footed by Paul Gallagher, Yann Kermorgant takes a shot. Save by David Marshall. 78:01 Booking The referee shows Ryan McGivern a yellow card. 77:27 Unfair challenge on Jay Bothroyd by Ryan McGivern results in a free kick. Peter Whittingham takes the free kick. 76:53 Effort on goal by Ross McCormack from just inside the penalty box goes harmlessly over the target. 76:25 Joe Ledley takes a shot. Blocked by Paul Gallagher. 74:45 Yann Kermorgant is penalised for a handball. Indirect free kick taken by David Marshall. 72:34 Effort on goal by Chris Burke from just outside the area goes harmlessly over the target. 70:57 GOAL - Peter Whittingham:Cardiff 2 - 2 Leicester Peter Whittingham gets on the score sheet with a goal from inside the box to the bottom right corner of the goal. Cardiff 2-2 Leicester. 68:04 Corner taken by Peter Whittingham played to the near post, clearance by Matt Oakley. 67:52 Chris Burke takes a shot. Blocked by Wayne Brown. 67:23 Ross McCormack takes the inswinging corner, Ryan McGivern makes a clearance. Correction - 65:41 The referee blows for offside against Michael Morrison. David Marshall takes the indirect free kick. 65:41 The referee blows for offside. David Marshall takes the indirect free kick. 64:45 Mark Kennedy is penalised for handball and concedes a free kick. Direct free kick taken by Paul Gallagher. 63:59 Yann Kermorgant has an effort at goal from just outside the box which goes wide of the left-hand post. 62:23 Yann Kermorgant challenges Anthony Gerrard unfairly and gives away a free kick. Free kick taken by Anthony Gerrard. 61:54 The official flags Michael Chopra offside. Indirect free kick taken by Chris Weale. 61:39 The referee blows for offside against Martyn Waghorn. David Marshall restarts play with the free kick. 60:47 Substitution Chris Burke is brought on as a substitute for Paul Quinn. 60:34 Shot from deep inside the area by Ross McCormack goes over the bar. 60:21 Michael Chopra takes a shot. Save by Chris Weale. 59:53 Martyn Waghorn is ruled offside. Free kick taken by David Marshall. 58:14 Handball decision goes against Richie Wellens. Direct free kick taken by Anthony Gerrard. 55:31 Free kick awarded for an unfair challenge on Michael Chopra by Wayne Brown. Ross McCormack crosses the ball from the free kick right-footed from left channel, clearance made by Paul Gallagher. 53:14 Michael Chopra is ruled offside. Chris Weale takes the indirect free kick. 52:32 Dany N'Guessan concedes a free kick for a foul on Darcy Blake. Free kick taken by Mark Hudson. 50:45 Matt Oakley has an effort at goal from just inside the box that misses to the right of the target. 50:12 Free kick awarded for a foul by Jay Bothroyd on Jack Hobbs. Indirect free kick taken by Chris Weale. 49:43 Free kick awarded for an unfair challenge on Jay Bothroyd by Jack Hobbs. David Marshall restarts play with the free kick. 48:50 Outswinging corner taken by Paul Gallagher from the right by-line, clearance by Joe Ledley. 48:13 Corner taken right-footed by Paul Gallagher, clearance by Anthony Gerrard. 45:00+3:07 The first half comes to an end. 45:00+0:41 Dany N'Guessan produces a right-footed shot from just outside the penalty box that goes wide left of the target. 44:15 Corner taken right-footed by Paul Gallagher, clearance made by Joe Ledley. 41:07 Jay Bothroyd concedes a free kick for a foul on Dany N'Guessan. Wayne Brown restarts play with the free kick. 40:06 Paul Gallagher decides to take a short corner, Effort from just outside the area by Paul Gallagher goes over the target. 38:54 The assist for the goal came from Martyn Waghorn. 38:54 GOAL - Dany N'Guessan:Cardiff 1 - 2 Leicester Dany N'Guessan finds the net with a goal from close in to the bottom right corner of the goal. Cardiff 1-2 Leicester. 37:41 The official flags Paul Gallagher offside. Free kick taken by David Marshall. 37:01 Effort from outside the penalty area by Jay Bothroyd goes wide left of the goal. 36:24 Free kick awarded for a foul by Martyn Waghorn on Anthony Gerrard. Free kick taken by David Marshall. 35:34 Martyn Waghorn challenges Darcy Blake unfairly and gives away a free kick. Indirect free kick taken by David Marshall. 34:54 Yann Kermorgant has a volleyed shot. Anthony Gerrard gets a block in. 33:42 Assist by Paul Gallagher. 33:42 GOAL - Michael Morrison:Cardiff 1 - 1 Leicester Michael Morrison finds the back of the net with a goal from inside the penalty area to the bottom right corner of the goal. Cardiff 1-1 Leicester. 29:25 Free kick awarded for an unfair challenge on Matt Oakley by Jay Bothroyd. Jack Hobbs takes the direct free kick. 28:12 Jay Bothroyd fouled by Ryan McGivern, the ref awards a free kick. Indirect free kick taken by David Marshall. 22:38 Foul by Michael Chopra on Richie Wellens, free kick awarded. Free kick taken by Wayne Brown. 21:46 Booking The referee shows Ross McCormack a yellow card for unsporting behaviour. 21:17 Free kick awarded for a foul by Ross McCormack on Paul Gallagher. Free kick taken by Michael Morrison. 18:36 Free kick awarded for an unfair challenge on Joe Ledley by Dany N'Guessan. Ross McCormack has an effort direct from the free kick. 18:06 Mark Hudson fouled by Yann Kermorgant, the ref awards a free kick. David Marshall takes the direct free kick. 16:25 Assist on the goal came from Michael Chopra. 16:25 GOAL - Jay Bothroyd:Cardiff 1 - 0 Leicester Jay Bothroyd scores a headed goal from close in. Cardiff 1-0 Leicester. 14:57 Joe Ledley is ruled offside. Free kick taken by Chris Weale. 14:27 Peter Whittingham takes the inswinging corner, save by Chris Weale. 12:59 Free kick awarded for a foul by Dany N'Guessan on Ross McCormack. Free kick taken by Mark Kennedy. 10:06 Free kick awarded for a foul by Joe Ledley on Richie Wellens. Paul Gallagher crosses the ball from the free kick right-footed from left channel, save by David Marshall. 9:09 Michael Chopra takes a shot. Blocked by Wayne Brown. 7:23 Effort on goal by Dany N'Guessan from deep inside the penalty area misses to the right of the goal. 6:47 Unfair challenge on Martyn Waghorn by Mark Hudson results in a free kick. Free kick taken by Ryan McGivern. 2:11 Effort on goal by Martyn Waghorn from just inside the penalty box goes harmlessly over the target.